At the end of the workday, most people are exhausted and want to rest. Rest is good and restorative. When you are on a quest for perfection, there is no such thing as rest. One is constantly in pursuit of an ideal, a quality, a body image that satisfies them via the satisfaction of others. It’s like being on a hamster wheel. This is the downside of perfection. Perfection could possibly be described as the attainment of a state where you are lacking nothing. It sounds quite ethereal and spiritual. In that sense, it would be something that you would continue to strive for but never attain fully. With spiritual goals, the journey is what brings satisfaction. With perfection, the journey is just another frustration that means “you aren’t worthy yet.” Who wants to live like that? Several people do, whether they know it or not. For many reasons, they are not happy (subjective) or satisfied with their lives. The focus is on everything outside: finances, career, relationships, children, fame and the like. It can lead to the pursuit of more goals but without an increase in satisfaction. Why? These people focus on outside stuff to validate their existence - who they are. As long as outside things can be changed, shift, or in the case of people, offer an opinion, you are standing on sinking sand in regards to perfection. Isn’t it time you let yourself off the hook? Realistically, you can be the best you can be but perfect is subjective as well and often unattainable in most situations. Even if it is attainable in some areas of life, it is not “maintainable”. 1. Perfection driven by fear – It could be fear of being unloved or fear of rejection if you don’t maintain a certain look or attitude. At some point ask yourself, is it worth it? Does this drive for perfection elevate or diminish you as a person? 2. 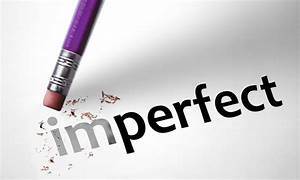 Perfection is frustrating – Pressure piles up like heat in a pressure cooker. You are going to blow if you don’t get some relief. Always pursuing but never achieving or maintaining can lead to strife, depression and a wasted life. 3. Unresolved issues can fuel your drive – Instead of dealing with the fact that your parents divorced and you feel it was your fault, you strive to be perfect so that doesn’t happen to you. One doesn’t absolve the other. 4. Perfection is conditional – Love should not be. For those who feel perfection is important, you are only of use to them when you can exemplify that ideal. Otherwise, they don’t want you. 5. Love doesn’t factor into it – If you love yourself is not relevant. But, it is love that leads to acceptance and real change if you want it. Otherwise, you are running from the true issue. The pursuit of perfectionism brings pain, dissatisfaction and self-loathing. Get rid of it today.